Perhaps your parents or grandparents have told you stories of the days when milk was delivered to the home daily or a couple of times per week by the happy, always on time Mr. Milkman. Those were the days before every home had a refrigerator... can you imagine? Where would we keep our leftover pizza? Where would we keep our open box of baking soda? Where would we forget about that half-eaten tuna sandwich we made late at night in famished desperation?? 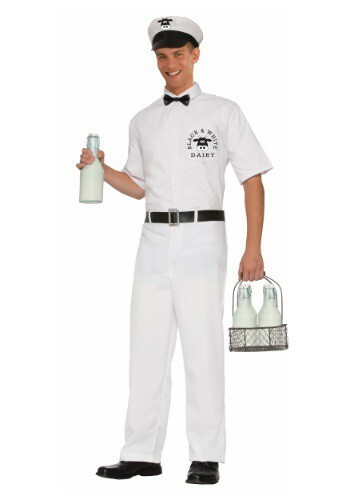 So many questions remain for this here milkman costume. While it recalls that earlier, perhaps simpler era, don't worry, you can still use the fridge as you always have... whew!